Girlie rosés, move over. The new gal in town hails from Crios, the second label from Argentine winemaker Susana Balbo. The Crios line includes a lovely Torrontés, an easy-drinking Chardonnay and three approachable reds: Malbec, Cabernet Sauvignon and a Syrah-Bonarda blend. The trio of handprints on the label represent Balbo and her two offspring, or crios. 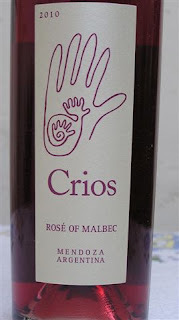 Then there's the Crios 2010 Rosé of Malbec, perhaps the gutsiest wine in the lineup − and certainly the most fun. Balbo uses the saignée method to bleed off the first-pressed juice from old-vine Malbec grapes. The result is a darker, richer rosé with spiced black raspberry and wild strawberry flavors that stomp the palate to take note of its surprising complexity, like an exuberant child showing off new tricks on the trampoline. Crios shows a burly edge that sets it apart from delicate Old World rosés. At 13.9% alcohol content, it's easily a fuller-bodied rosé any red wine lover can embrace. In-your-face flavors and aromas are sure to win over a few rosé-haters and seduce wine enthusiasts who haven't yet been dazzled by rosé's singular charms. Screwcapped and priced around $10 at Dan's Wine Shop in Palm Desert, it's a no-brainer to have on hand any time of year, and a wine we look forward to snapping up every vintage. If you're already thinking turkey day, look no further. Broad-shouldered and juicy with a spice-packed palate, Crios makes a terrific Thanksgiving wine. It's a crowd-pleaser that can sail through the entire meal, from earthy first courses through to turkey and the trimmings. Give it a good chill and let the party begin.